Young “semi-crianza” wine (4-6 months in French oak). Its fruit and freshness is laced with a trace of oak. Available as a range of white, rosé and red wine. 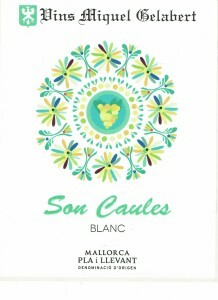 Grape varieties: Macabeo, Moscatel and Premsal Blanc. Alcohol content: 12- 13 % vol..
Ageing: 4 months in new oak barrels. Tasting Notes: Clean and bright, pale yellow with Green tints. Fresh fruit and floral aromas, green apples, etc. with a very soft touch of wood. Fresh with balanced acidity on the palate. This wine is very Mediterranean.